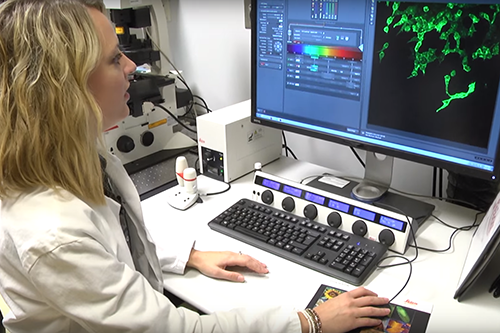 Former graduate student Jessica Konen, PhD, looks at lung cancer leader cells. The differences between leaders and followers -- and their interdependence -- could be keys for future treatments aimed at impairing or preventing cancer metastasis, says senior author Adam Marcus, PhD, associate professor of hematology and medical oncology at Winship Cancer Institute and Emory University School of Medicine. "We're finding that leader and follower cells have a symbiotic relationship and depend on each for survival and invasion," he says. "Because metastatic invasion is the deadliest aspect of cancer, our goal is to find agents that disrupt that symbiotic relationship." "We saw that when the leader cell became detached or died unexpectedly, the followers could no longer move," says Konen, now a postdoctoral fellow at MD Anderson. "In one particular movie, we saw a leader cell come out away from the rest of the cells, and then seem to realize that nobody was following him. He actually did a 180, and went back to grab cells to bring with him." To study what makes leader and follower cells different from each other, Marcus and Konen developed a technique for marking the cultured cells with a laser, thus changing them from fluorescent green to red, and then isolating red cells. They call this technique SaGA, for spatiotemporal genomic and cellular analysis. Once isolated, the leader cells maintain their invasive behavior and have a distinctive shape. When added back to purified followers, leader cells will restore followers' mobility and tentacle-like invasive behavior, even if the leaders are only 1 percent of the mix. While the leader cell state is durable, followers will "spawn" new leaders after a month or two of growth in culture, Marcus says. Leaders show several differences from follower cells in the patterns of genes that are turned on or off. For example, leader cells secrete more VEGF (vascular endothelial growth factor) than followers do. VEGF is important for the growth of blood vessels and is the target of anti-cancer drugs such as bevacizumab, known commercially as Avastin. By themselves, leader cells do not need VEGF for invasive behavior, but VEGF appears to be important for pack formation because it is a mobility factor leaders provide followers. In contrast, what followers provide leaders is the ability to grow and survive. When growing separately from followers, leaders increase their numbers at a slower rate, have erratic cell cycles and have more "blebs", which are bulges of the cell membrane. Contact with followers rescues these problems, the researchers found. Other molecular differences between leaders and followers include traction-generating FAK (focal adhesion kinase) activity in leader cells and growth-promoting Notch signaling in followers – both potential avenues for disrupting the symbiotic relationship between leaders and followers. A related paper on the potential use of FAK inhibitors against lung cancer was recently published in JCI Insight by Marcus and his colleagues. The Nature Communications paper covers lung cancer cells; a similar phenomenon of collective invasion led by distinctive cells has been observed in breast cancer, but different genes and biochemical pathways appear to be important in each system. "I think what's needed for collective invasion will depend on the environmental stresses the cancer cells face, and it may shift with treatment," Marcus says. As described, the SaGA technique depends upon first having a photo-convertible fluorescent green protein called Dendra in the cells. Marcus' lab is now testing whether similar approaches could work when studying tumor organoids derived from cancer patients, either using Dendra or with photo-convertible dyes. Marcus stresses that SaGA can be applied to additional cell types or environments, or other types of cancer cell behavior such as drug resistance. His lab continues to study the genetic and/or epigenetic basis for the differences between leader and follower cells. A video explaining SaGA won first prize in a contest organized by the Association of American Medical Colleges in 2015. See video. Co-authors include graduate student Emily Summerbell, senior research scientist Bhakti Dwivedi, PhD and Winship faculty members Wei Zhou, PhD, Lawrence Boise, PhD, Paula Vertino, PhD, Lee Cooper, PhD, Khalid Salaita, PhD and Jeanne Kowalski, PhD. The research was supported by the National Cancer Institute (R21CA201744, P30CA138292, F31CA180511, U24CA180924, U24CA19436201) and by Winship Cancer Institute developmental funds.